Everyone Out of the (Tax) Pool! And now for something completely not different: The New Castle County Tax Pool. Ahead of the WEIC town hall scheduled for this evening at Cab Calloway, here’s some information on the New Castle County Tax Pool, as it was brought up during the last WEIC town hall (and some errant information was given by WEIC regarding how each district contributes to the pool). I’ve written and given presentations, blog posts, Facebook posts on public school financing for the last couple of years and I haven’t mentioned the tax pool hardly at all even though it does significantly affect the tax revenue (in a negative way) for both Red Clay and Christina. So what is it? Rabbit hole alert! The money collected with the tax pool rate gets put into a big pot. DDOE uses wizardry to allocate the pool money out to the districts. Ok, it isn’t really wizardry but the formula is all kinds of jacked up and outdated. C) Allocation Factor * Tax Pool Receipts = how much tax revenue is returned/lost for each district from the pool. In this bar chart separated by School District, the red bars indicate the gross operating tax receipts collected by each district in millions $ (money collected via Operating Tax). 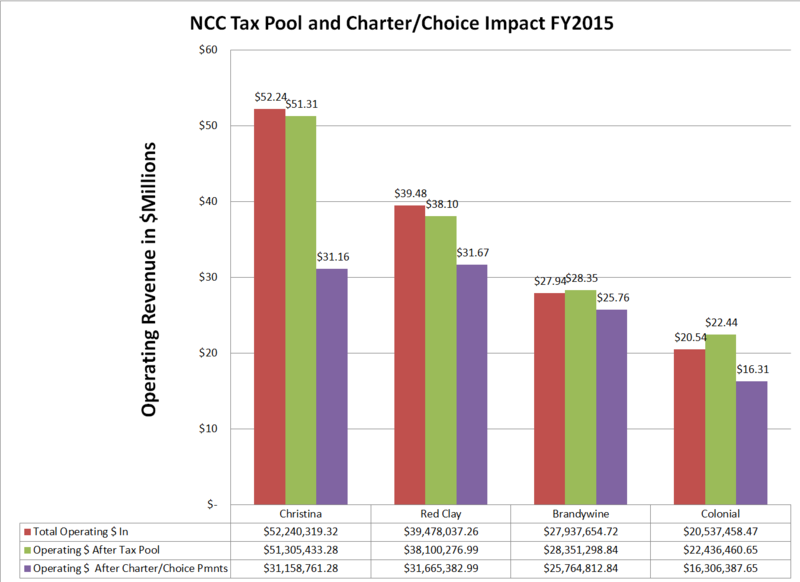 The green bars show the after-effects of the New Castle County Tax Pool. You can see that both Christina and Red Clay are net contributors to the pool (they pay in more than they get out). Brandywine and Colonial are net beneficiaries (they receive more from the pool than they put in). The purple bar shows the after effects of the payments each District makes to Charter and Choice schools, illustrating how much general operating revenue remains for running the Districts. Infer from these graphs what you will, but I feel it is beyond doubt that our public school funding mechanisms are woefully obsolete. In fiscal year 2015 (school year 2014-15) the four school districts made payments to charter schools totaling approximately $35,000,000. 50% of that was paid through Christina alone. WEIC wants to have a conversation about public school funding. We all need to be part of that conversation because the funding issue extends well beyond the City of Wilmington. This seems like an ancient legacy. How long has it been in place to ease the transition from a county district, 25 years? If this new commission is going to propose a modernization of the school system then they should eliminate this outdated practice. Do you agree? Why didn’t you also show out-of-district-choice payments? In both cases, district residents have options beyond their local district schools. The money follows the student to whatever public school they attend. Some students attend charters and others attend out-of-district district schools, while the majority still attend their home-district district schools. There is no one right option. I absolutely agree that the commission should propose the elimination of the tax pool. There was a time when it made sense, but with the changes in needs based funding and the overall proposal to consolidate all the Wilmington schools into 1 district, any purpose the tax pool had left is now gone. I can certainly modify the graph to include the sum of choice payments too. Though it would not change the overall breakdown that much in terms of percentages for each district. 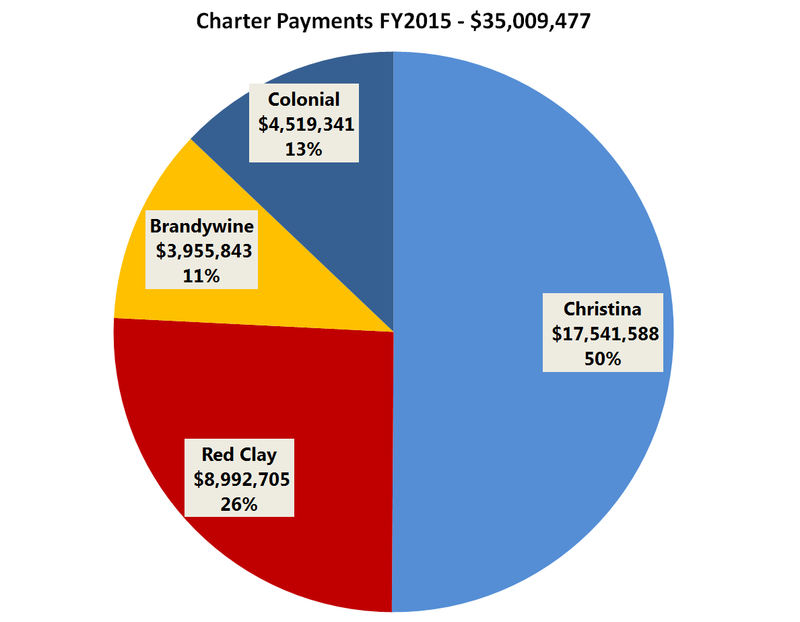 Red Clay would see a bump in revenue when factoring in Choice payments, Brandywine a smaller bump. Both Colonial and Christina pay more out in choice than they get in.